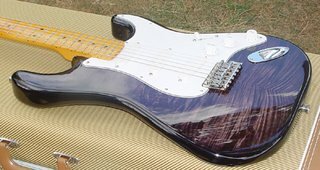 Guitar-mod.com is the home of Rothstein Guitars. Andy Rothstein builds custom Strat and Tele-type guitars-- basses too. Not only that, Rothstein also builds mods that you can purchase, including loaded pickguard configs. The website is a wealth of great info. for any Strat geek. If that weren't enough, Andy is also a very cool guitar player; a great advantage for any luthier. So you can imagine when he builds an instrument, the attention to tone and playability is top priority. Our Friday Strat #17, the "Translucent Black Burst S", is simply loaded with goodness through and through. Yep, if Wheaties featured Strats on their cereal box, this unit would be on it. The headstock is even normal... whew! Body: Chambered ash with flame maple top. Thin urethane finish. Click Here for a complete build documentary with more photos and specs! Be sure to explore the rest of the site for ultimate Stratisfaction!